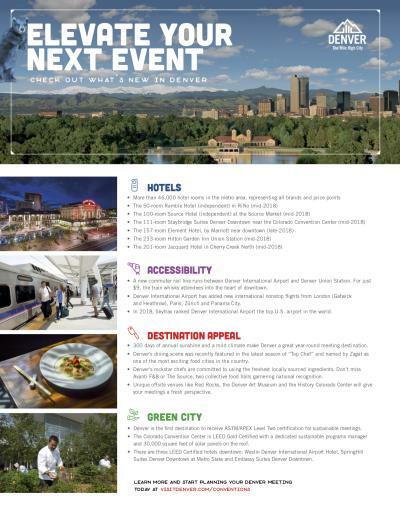 The following materials have been created to help you promote Denver as the ideal location for your meeting or event and highlight the many great aspects of the city. A wide variety of elements have been included to meet your marketing needs, all of which have areas that you can customize with your logo, event name and dates. VISIT DENVER has compiled a library of top photos for your use. Click here to access the photo library. If you are looking for photos not included in the above library please register for access to Barberstock, our online photo and video library or contact your VISIT DENVER representative. VISIT DENVER has a mix of videos for you to use in your promotional materials. Simply share the link or embed the video into your digital content. If you would like copies of these video files please contact your VISIT DENVER representative. 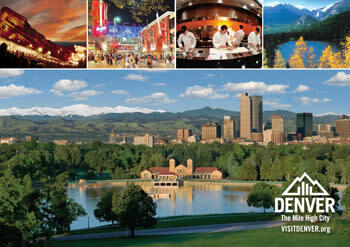 VISIT DENVER is active on the major social networks listed below. Our content is tailored to bring you local stories and helpful information on the best ways to enjoy your time in Denver. Follow us and share with your incoming meeting attendees. Flyers to be printed for your uses, your logo may be inserted. Programs Required: To edit the flyers you will need a page layout program like Adobe InDesign or Quark Xpress. 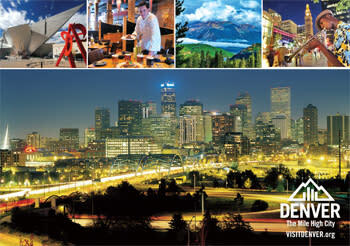 Download our postcards to mail to your attendees and get them excited about Denver! A scenic shot of Denver&apos;s City Park, the skyline and the Rocky Mountains. The Denver skyline, full of excitement, during the early evening. The Colorado Convention Center&apos;s 40-foot Blue Bear statue is actually named, "I See What You Mean" by Denver artist Lawrence Argent (1957-2017). It is a steel sculpture, encased in a fiberglass and cement composite and acts as a Denver ambassador, communicating the city&apos;s appeal as a meeting destination. Click here to read an exclusive interview with Lawrence Argent. Many groups have used the Blue Bear to help them promote their meeting. 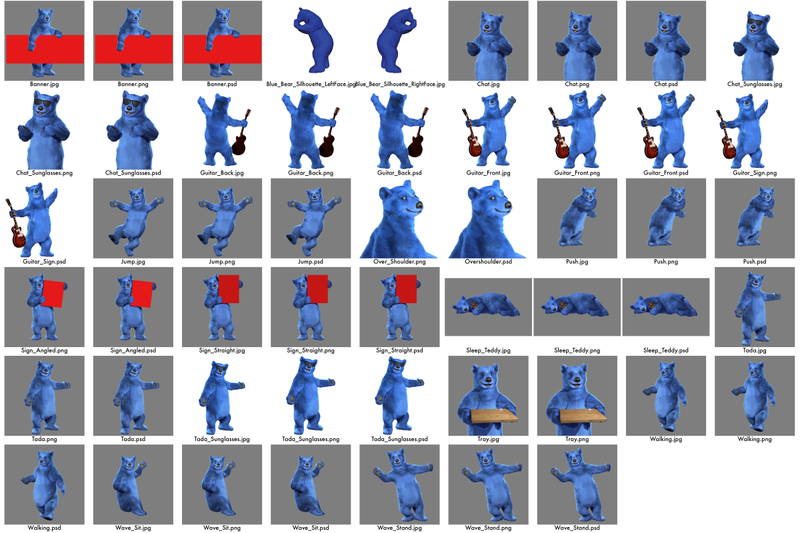 VISIT DENVER can assist you in this process by providing downloadable versions of the official Blue Bear files, available to you here. The artist&apos;s estate retains copyright to the statue itself and to all visual representations. VISIT DENVER has a copyright license agreement with Lawrence Argent&apos;s estate that covers certain specific uses and poses for the Blue Bear, and we are able to offer those resources via the files below. The files can be used in your promotional material, but may not be altered in any way. Should you require other uses of the Blue Bear, we will be happy to put you in touch with the artist&apos;s estate directly to work out separate arrangements. If you have additional questions about use of these files, please contact Jessica Weissman at 303.571.9496 or jweissman@visitdenver.com. 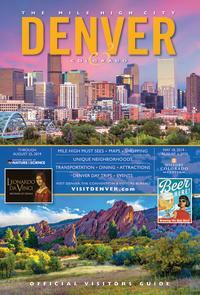 VISIT DENVER is happy to provide Denver, The Mile High City logos for use on your marketing materials. Please download the .zip file to access the complete library of logos. Explore the Mile High City! 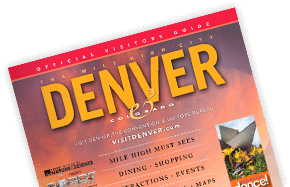 VISIT DENVER offers multiple resources for meeting planners and attendees, which include our mobile applications (iOS, Android), mobile websites and our Official Visitors Guide download for iPad. The files below can be used to promote these programs. To save an ad, simply right click on it and choose "Save As". VISIT DENVER offers up-to-date partner, event and offer information available to use on your meeting or convention website and app. These documents contain Denver copy, including descriptions of The Mile High City from 25 words to 100 words, as well as Denver facts, high-altitude tips and more! Programs Required: To edit the Copy Document, you will need to use a text editor or Microsoft Word. Available in 25, 35, 50, 75 and 100-character length. Colorado is, simply put, one of the most amazing playgrounds on earth, with four-season excitement and breathtaking landscapes. Many visitors to Denver choose to begin or end their trip in one of our charming historic towns or world-class mountain resorts. Our "Come Early/Stay Late" program gives your customers helpful information on many of Colorado’s most iconic areas and top resorts. Click here to learn more. The Destination Planning Guide is the ultimate planning tool for meetings and conferences in Denver with listings for event facilities and more. Promoting your event has never been easier. Order items such as promotional brochures, photos and pins. Get a group fired up and informed for a Denver visit with helpful marketing tools like postcards, flyers, visitor and dining guides, apps, videos and more. Download our Visitors Guide and find fun activities, hotels, restaurants and more! Get ground transportation maps of Denver, including the downtown area, hotels and bike routes.